Gifts are a funny thing. A year ago, for Christmas 2012, my wife “gave” me an iPad mini. I use quotes because I actually bought it; supply was constrained, and when we got a notification that there were models in stock, I quickly dashed over to my local Apple Store1 and picked one up. It was a great present, and I used it happily for the next year. Knowing my fondness for headware that makes me look like I’m 50, my wife had surreptitiously ordered another gift, and it totally made my day when I opened it. I was surprised, and I was delighted to receive something I loved but hadn’t even considered. It was a better gift than the iPad, even though any sort of “gift analysis” would suggest the exact opposite. I would imagine nearly all of you can relate to this story: we make lists of what we want, and hope our loved ones follow it, but truthfully, the presents we really love are things we never would have thought to ask for. However – and this is the rub – it’s a big risk to buy something unasked for. There’s always the chance that your gift will crash-and-burn; to give something that surprises and delights takes great thought, empathy, and a true understanding of the giftee, and most of us quickly retreat to the safety and ease of the list. Gift-giving is a great example of the “uncanny valley” framework I’ve referenced with regards to Microsoft and Twitter. The “good” option is buying off the list; the “great” option is buying something even better; the “bad” option is getting it wrong, and you have to risk just that to go from good to great. 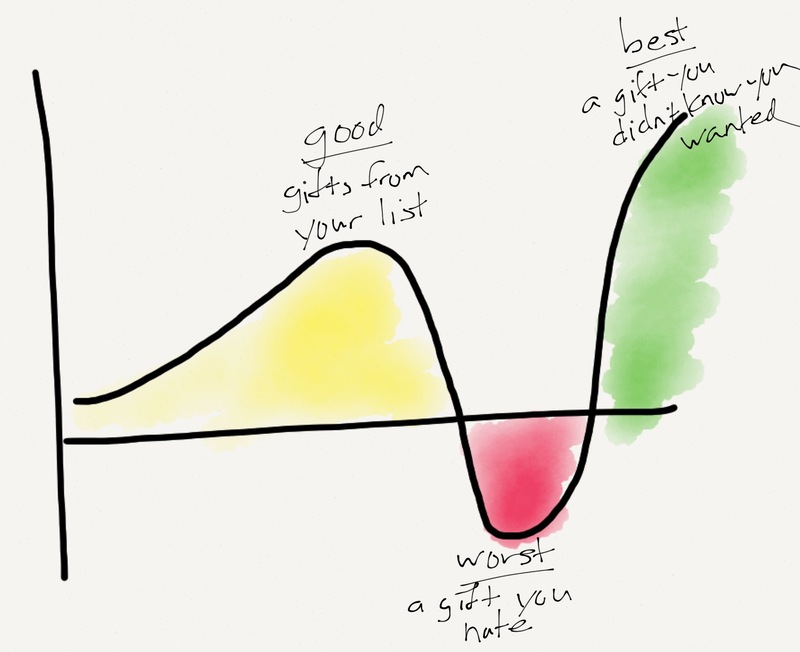 I also think gift-giving is a useful metaphor for thinking about the difference between design thinking and market research when it comes to the development of new products. “Marketing”, properly defined, is about a great deal more than just advertising. Rather, it’s about knowing and understanding your market, and developing products that fit that market. The traditional tools in this sort of work are what you might expect: surveys, interviews, focus groups, etc. After all, the best way to give the customer what they want is to, well, ask them what they want! Moreover, things like focus groups and survey results are really useful for winning arguments internally. If you want your vision of the product to win funding and support, there’s no greater weapon than a nicely presented chart showing that prospective customers demand such and such a feature. This is the way the vast majority of businesses, both within tech and without, operate when it comes to new products. And it’s successful! Customers ask for X, the company makes it, and the customer buys it – if it comes in at the right price, of course. Because that’s the downside of developing based on characteristics and features that can be articulated by your customers: they can articulate those same characteristics and features to your competitors, and let you duke it out with all of them until the marginal profit of your product approaches zero. The brands that resonate, that people love – most famously Apple, of course, but there are other examples3 – are those that suprise and delight. In fact, those words are a central tenet at Apple, and one of the primary standards by which all products are measured. What few appreciate, though, is that when Steve Jobs bragged about not doing market research or not holding focus groups, he was not saying Apple did less than the competition; rather, they did so much more. It is this lack of understanding and appreciation for the very hard work and deep thinking required to surprise and delight that leads to countless companies and Steve-Jobs-wannabes crashing-and-burning, even as they declare their fealty to design. What they don’t understand is that design is not just about looking good, or working well, or even being easy-to-use. The most fundamental part of design is truly understanding your customers at a deeper level than they even understand themselves. Moreover, to truly be design-centric is harder than being market-centric. Things like surveys and focus groups persist because, while the products that result may not inspire love, they don’t inspire hate – or worse, apathy – either. It is wonderful to see so many new products that are beautiful and easy-to-use. But great designs are as rare as ever – just as rare as those gifts that occupy an outsized place in your memory relative to their monetary or symbolic worth simply because someone took the time and effort to truly understand you.